October 25 @ 6:30 p.m. - 9:30 p.m.
Join us for an evening of networking, fashion and fun as we welcome Tziporah Salamon. 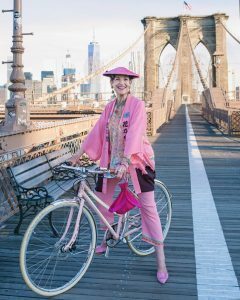 Tziporah Salamon is a celebrated fashion icon, Lanvin model, author, and artist. She believes that teaching women of all ages the fundamentals of design is tikkun olam. Putting an outfit together is “my art,” she explained. Her unique look helped her become a model for French fashion house Lanvin—at the age of 62. Spend the evening with Salamon as she shares her pearls of wisdom and treasure trove of fashion advice. She’ll have us dressing to the nines. Complimentary parking. Dietary laws observed. This event is sold out – we appreciate the enthusiastic support from the community! If you would like to be placed on the wait list, please call 301-770-8329. No refunds. There will be no onsite registration for this event.